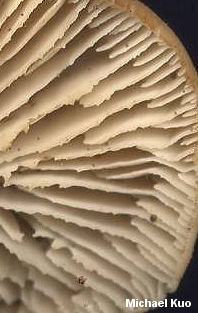 The features that define the genus Lentinellus include: gills that are serrated or jagged; growth on wood, usually in clusters; peppery or acrid taste; and amyloid spores that are finely spiny or warted--though the spores in some species can be so finely ornamented that they appear smooth unless you have a very good microscope. Many species of Lentinellus lack stems, but some have rudimentary, lateral, or even central and well developed stems. Lentinellus is a well studied genus, and the recent publication of A Preliminary Monograph of Lentinellus by Petersen and Hughes (2004; citation below) represents a true masterpiece in contemporary taxonomy. The authors have studied species world-wide through morphological, cultural, and genetic lenses--so the species they recognize are supported by physical differences, mating studies, and DNA analysis. In the bigger picture, molecular studies have revealed Lentinellus to belong to the Russulales, along with species of Russula, Lactarius, and the polypore Bondarzewia berkeleyi, among others. All of these mushrooms, it appears, evolved on their own branch of the tree and are more closely related to one another than to the mushrooms in the Agaricales or the Polyporales. Lentinellus micheneri Stem central, compressed or grooved; cap to 4 cm across, brownish; on the wood of conifers or hardwoods; widely distributed. Lentinellus ursinus Stem absent; cap to 10 cm across, brownish to buff, hairy or velvety (at least on the inner 1/3); primarily on the wood of hardwoods; widely distributed. Miller, A. N. & Methven, A. S. (2000). Biological species concepts in eastern North American populations of Lentinellus. Mycologia 92: 792-800. Miller, O. K. & Stewart, L. (1971). The genus Lentinellus. Mycologia 63: 333-369. Petersen, R. H. & Hughes, K. W. (2004). A preliminary monograph of Lentinellus (Russulales). Germany: J. Cramer. 268 pp.